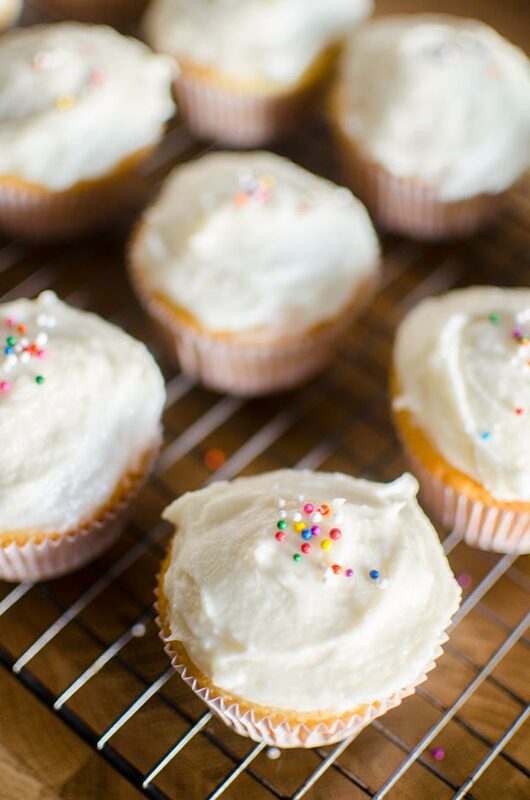 The easiest homemade cupcakes in the world are fluffy and moist with simple vanilla frosting. This recipe was originally published on July 12, 2010. Cupcakes are all the rage, and honestly, they are one of those desserts you need to have in your repertoire. This is an incredibly easy vanilla cupcake recipe, so much so that these might just be the easiest homemade cupcakes in the world! Quite a big statement, I know. But if you’re looking to make cupcakes at home, look no further this is the recipe for you. I’m definitely more of a cook than I am a baker, so when I do bake, I try and keep things relatively simple. Apple crisps and peanut butter oatmeal chocolate cookies are kind of my go-to treats. I hate to admit it, but for years I always relied on cake mixes to make cupcakes–I know, I know. It’s ok. I first shared this recipe for homemade cupcakes back in 2010, and it was the first time I ever made homemade cupcakes from scratch. Since then, I’ve made this recipe countless times, and have made many tweaks and changes. You’ll need to use a hand mixer or stand mixer for this recipe because it uses the reverse creaming method. What is the reverse creaming method for making cupcakes? In the reverse-creaming method, the dry ingredients and the sugar are mixed together first, as opposed to creaming the butter and sugar together. Then the fats and a portion of the liquids are mixed into the dry ingredients followed by the remaining liquids. 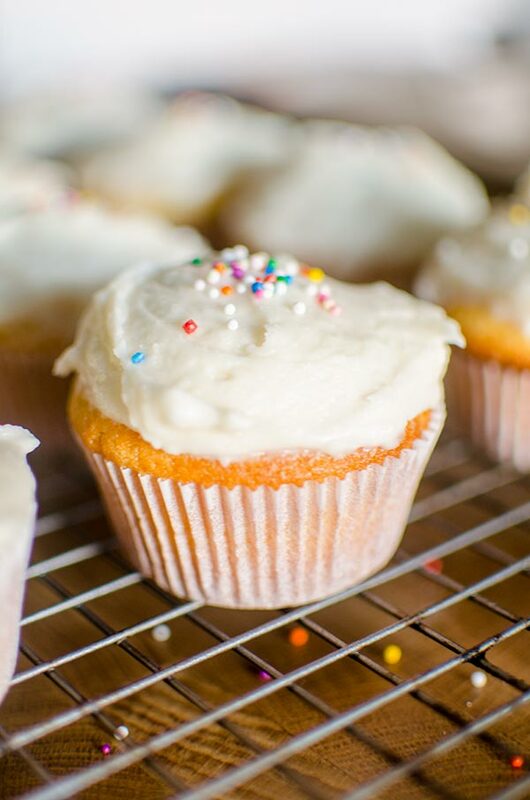 These are seriously the easiest cupcakes in the world, and if you, like me, are used to using the mixes, seriously try this, you’ll never go back. 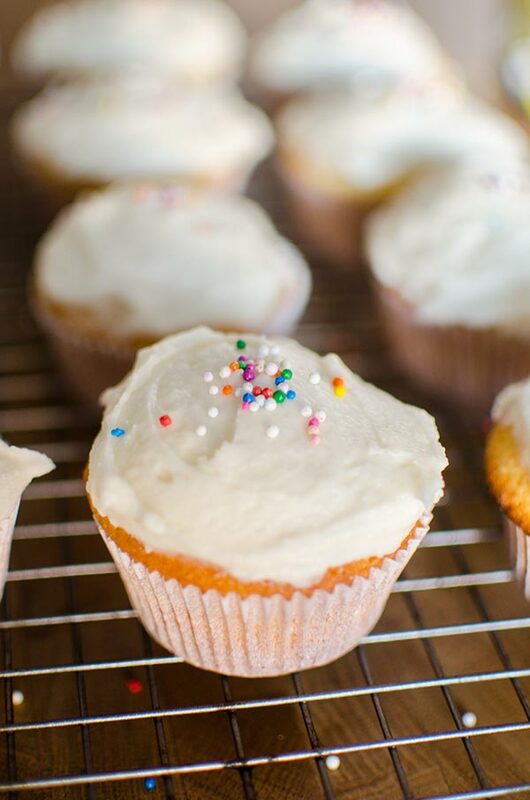 With a few simple ingredients that you most definitely have in your pantry, whipping up a batch of homemade vanilla cupcakes is a no-brainer. Baking fluffy, moist cupcakes comes from creating air bubbles in the batter that expand in the oven. Avoid over-mixing (this collapses the bubbles) and over-baking. When you’re making cupcakes, mix on low speeds and stop just as the ingredients blend together. Vanilla is a fool-proof favourite that are perfect for any party or birthday, but if you’re looking to make another variety of cupcakes, you can also try my easy banana cupcakes which use overripe bananas for a touch of sweetness. This really is the best cupcake recipe out there because it never fails! I like to make mine with a really simple vanilla buttercream frosting, but you could definitely do a delicious chocolate frosting as well if that’s more your style. Add in 1/2 cup of milk and the egg, mix on medium until the flour mixture is completely moistened and the egg has been incorporated. Add the remaining milk and vanilla and mix until just combined--it's ok if there are some lumps in the batter. Place the paper liners in your muffin tin and fill the cupcakes about 3/4 of the way full. Bake in the centre of the oven for 18-20 minutes or until a toothpick inserted into the middle comes out clean. Remove from oven and allow to cool before frosting. In a small bowl, beat together butter, sugar, milk and vanilla until light and fluffy. Let me warn you, give these away to friends because it’s very easy to get carried away, and soon enough you’ll be surrounded by cupcake liners and no more homemade cupcakes! I always use the boxed cake mix for vanilla flavored cakes. I just can't seem to find a great tasting vanilla cake recipe. I need to try this!! They look great!! I was wondering how many cupcakes this make. I have to make over 32 so should i double the recipie?? Hi Faith,So glad that you enjoyed them! i am going to check this out right now!!!!!!!!!!!! ok do you no why!!!!! BECAUSE I JUST LOVE COOKING !!!!!!!!! I am going to try this recipe out right now. Thanks for the post. HI Ciara,Hope it all went well, let me know! Hi Rose Marie,So glad that you liked them and were a hit with your family! sounds like a great recipe! i have to do a demonstration speech in my Public Speaking class and this is what i plan on doing! Hi Jennifer, that's so amazing! I love to hear that you'll be using it for your class. Good luck on your speech! Do you have to use baking powder? Also do you have to use vanilla? Hi Chloma,Yes you most definitely need to use baking powder and vanilla in this recipe. The baking powder helps the cupcakes rise and the vanilla gives them their flavour! I'm making these today but I noticed the ingredients say 3/4 cup of milk but in the instructions (#4) it says 1/2 cup of milk. Can you confirm which is the correct amount? That's what I figured, so it's what I did! The cupcakes came out better than a box mix! Thank you for the recipe!! Wish I could send you a pic! I'm so glad that you enjoyed them, Dara! Just found this post today while looking for an easy cupcake recipe I could make with my 3-year-old. I always make little tweaks in the "healthier" direction when I'm trying new dessert recipes, so I used a little less butter and subbed egg whites. My daughter and I had a blast making them + they turned out great! Thanks so much!! Great recipe! I was wondering if you would know a quick fix to make these gluten free? I tried and used gf all purpose flour but they are very crumbly. Maybe I should have added xanthan gum? Any tips would be great! Hi Stephanie,I'm not too sure about a quick fix to make these gluten free. I know that xanthan gum would help with the binding. Maybe try adding an extra egg yolk also? I've never tried to make these gluten free so those are just a couple of guesses! These were good, for sure, but the consensus from my family was that it tasted more like cornbread than a cupcake. I did use white whole wheat flour, so maybe that was it, I will re-try with white flower. Like I said, definitely a good taste, just not what I expected. Hi Rirhy,Thanks for letting me know - like you said, the white whole wheat flour might have changed the texture. Usually these are quite light and fluffy! Have you ever used this recipe to make a cake (instead of cupcakes)? I've made this for cupcakes, and they turned out great, but I am assuming that all I need to do to turn it into a cake is bake it a bit longer? Let me know what you think. And thanks for the recipe! Hi Theresa, this comment seems to have gotten lost, I apologize for the delay! I've never used this recipe for a cake but it would definitely need a longer baking time which would depend on the size of the pan you are using. For an 8-inch pan you're probably looking at something closer to 35-40 minutes, always poke with a toothpick or knife to see if it's finished baking! 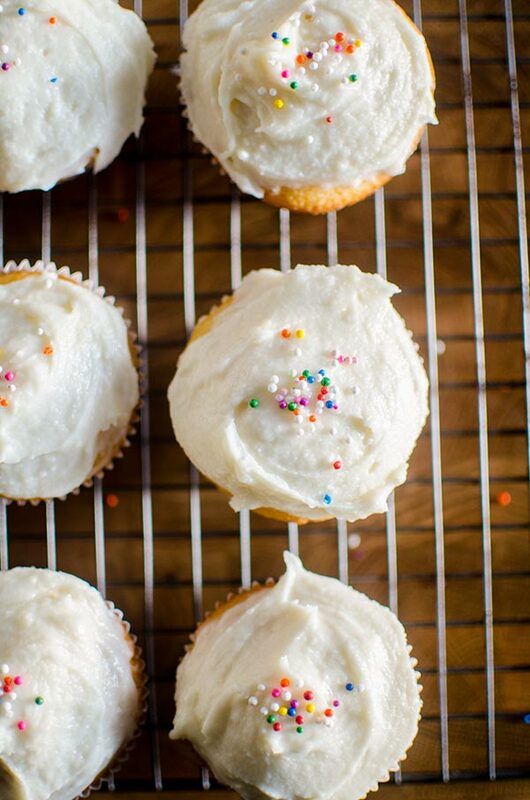 What type of frosting is best for these cupcakes? 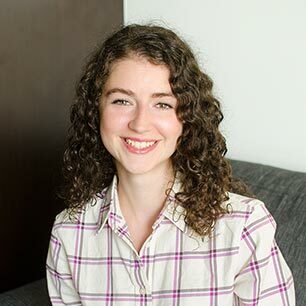 Hi Kristen, I use unsalted butter here. Happy baking! Can you make the cupcakes and not use the paper liners? Hi Margie, I have not tried it myself, but I imagine it would be fine if you grease the muffin tin enough.